Portatīvais dators un projektors neietilpst komplektācijā! Two tops made of black PVC, independently adjustable for double level height (77 or 87 cm). 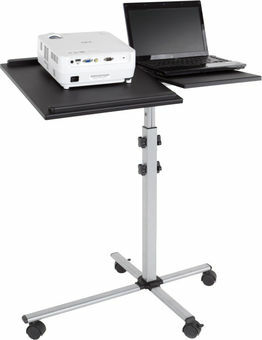 The projector deck featured with anti-slip strips; tilt adjustable ±35°. Steel construction, painted in steel-grey. 4-castor base (2 lockable).